Spend your holiday directly in Willingen, central and with shopping opportunities. The apartment is located in the heart of town. 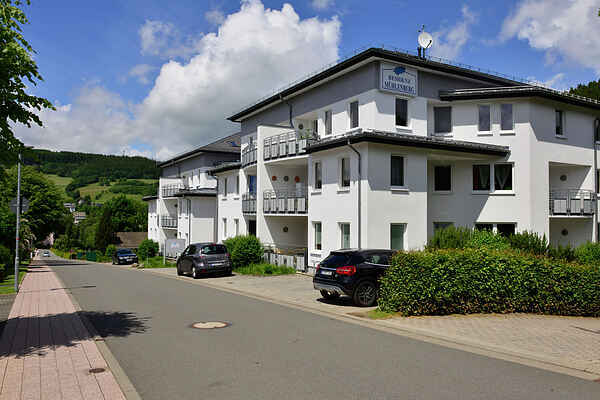 The accommodation boasts a nice hillside location with views over Willingen and the Ittertal valley. Get ready to enjoy wonderful and varied holidays in the Sauerland region. The following facilities are in close proximity: The Lagunen water park, ice rink, movie theatre and the tourist information office. Nearby, you have the option to ride the ski carousel. The apartment is fully furnished and individually designed. Due to its top location, Willingen is an attractive destination, where the whole family can enjoy the numerous possibilities year-round. The World Cup town with its ski jumping hill offers diverse leisure facilities that guarantee great experiences for everyone. Adventure golf, an exhibition mine, summer toboggan run and the amusement park are just a few examples. In the winter Willingen is a paradise for skiers and cross-country skiers. Popular excursions: Lake Edersee (45km), lake Diemelsee (20km), the palace in Bad Arolsen, Kassel (60km), Paderborn (50km), Winterberg (25km), Korbach (20km), Fort Fun adventure park (40km).